After strategically leaking snippets of detail on their new development over the past couple of months, Fuji today unveiled their new Norcom Straight. It’s a time trial/triathlon bike that has taken three years to develop, and which aims to be stiffer, more aero and offer better adjustability than anything they’ve offered previously. 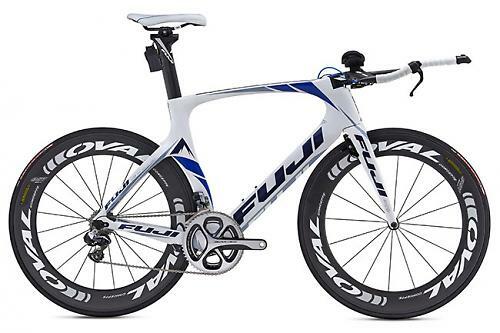 When it came to penning the design of the new bike, Fuji used their D-6 time trial bike as a starting point and, using tube shapes based on the nose section of the NACA 0030 airfoil, completely redesigned the bike. They’ve sought to minimise the front surface with narrow profiles, and the area between the fork and downtube has been shaped to smooth laminar airflow between these two sections. They’ve integrated the seat clamp into the top tube, and the junction between this and the seat tube has been heavily work upon to reduce turbulent air. They’ve gone with TRP’s TTV time trial brakes, a linear-pull brake design, mounted behind the fork and below the chainstays just behind the bottom bracket. The frame is mechanical and electronic transmission compatible. A BB86 bottom bracket helps Fuji maintain the stiffness from the D-6, with a claimed 26% increase in this area. Further stiffening of the frame comes via the use of RIB (Reinforced I-Beam) technology which adds a stiffening beam to the down tube. 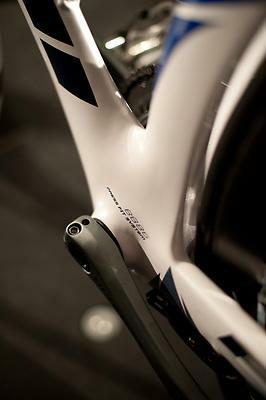 This also features in the fork blades as well, which leads to a claimed 20% stiffness increase at the front of the bike. 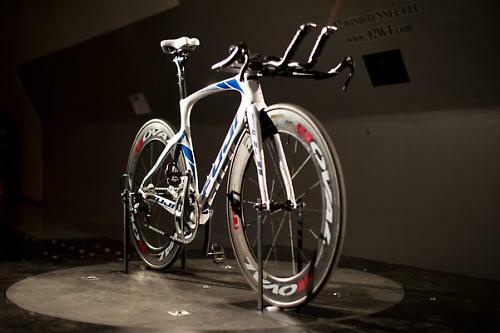 Fuji tested the final prototype against their own D-6, and found a an 18% improvement at a -10 degree yaw angle (which they reckon is the most common yaw angle) with a wind speed of 30mph. 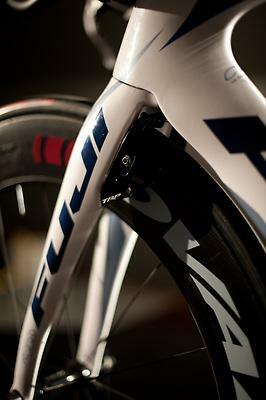 At increased yaw angles, Fuji found even bigger improvements - up to 27%. As about 85% of the total drag is that caused by the rider - the bike counts for relatively little - Fuji have concentrated much of their efforts on a design that allows huge adjustability. 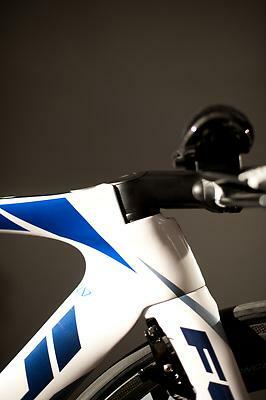 Increased adjustability allows the rider to more easily tune in their preferred aerodynamic position. 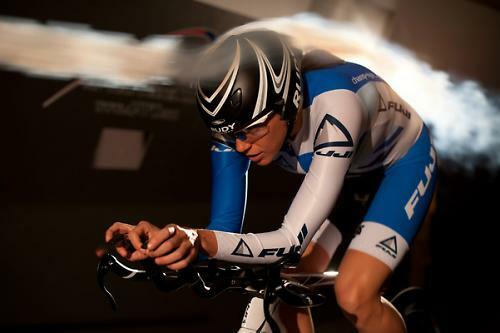 Fuji have also tackled the differing demands of time trialists - who favour maximum aerodynamics - and those of triathletes - who focus on efficiency as they need to save energy for the run. In order to offer a bike with such adjustability Fuji have worked with Oval Concepts and use their stem, bars and seatpost. The integrated stem is available in size lengths from 80-130mm and in two rise options, ±8° and ±17°, and there are a total of 24 possible stem positions. 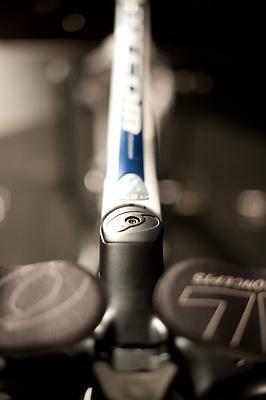 The stem slots into the recessed head tube and creates a smooth line into the top tube. 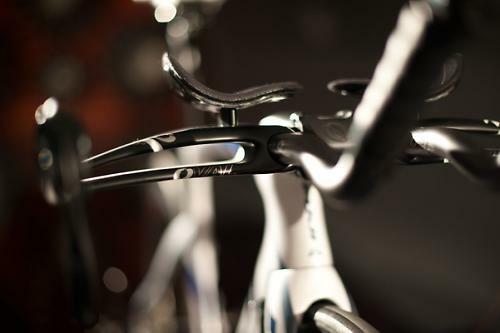 They pair the stem with Oval Concepts’ new 960 aero base base, a low-profile design made from carbon fibre that keeps to the UCI’s 3:1 aspect ratio rule. With a range of spacers there are 60 possible armrest positions. A range of extensions furthers the customisation. The seatpost has a range of seat tube angles from 74° through 81° degrees to meet the difference requirements of the different governing bodies. The 400mm post offers a height adjustment range of 180mm. The bike has had its first outing at the Giro del Trentino team time trial under the NetApp-Endura team.